Published on Monday, April 1, 2019. This article appears in the April/May 2019 issue of American Craft Magazine. Collaboration with a Bird V, #2 (2016), includes wood bits carved by Charmin, metalsmith Teresa Faris’ companion of more than 25 years. Teresa Faris believes animals deserve the utmost respect. 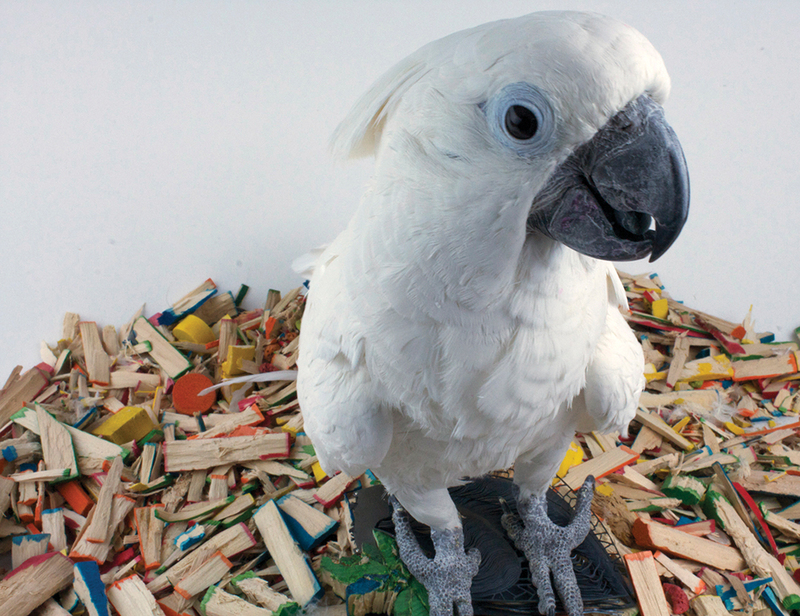 So she’s a vegan, she doesn’t use animal parts in her artwork, and the creative partner she calls her “greatest teacher” is an umbrella cockatoo named Charmin. The metalsmith isn’t sure how she arrived at her reverence for the animal kingdom; maybe it’s the Sami ancestral knowledge in her DNA. “I’ve always had these beliefs,” she says. In any case, her views have been cemented by her bond with Charmin. 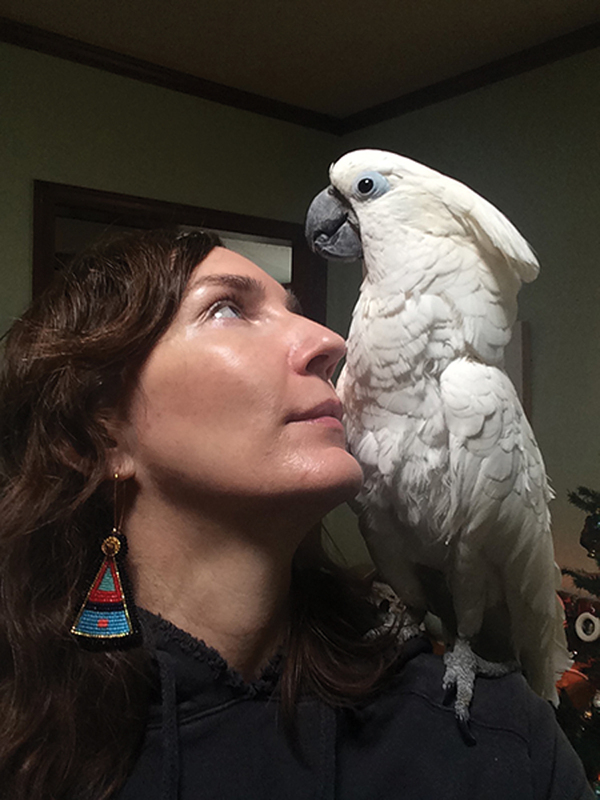 Now living in Madison, Wisconsin, Faris was an undergrad in Oshkosh in 1993 when she rescued the cockatoo, abandoned in a toilet-paper box outside her apartment. Today, bird and human are so close they practically read each other’s minds. With one glance at the lie of Charmin’s feathers, Faris knows whether the bird is relaxed, scared, or under the weather. Charmin knows that when Faris and her husband grab their drum and guitar, there’s fun ahead. “She’ll sing along; I’ll come up with a joik [Sami folk song], and she’ll get in on it,” Faris says, adding, “She’s a really good dancer.” Most important, Charmin, as she has for 12 years, lets Faris know when she’s finished carving a wood piece with her beak and it’s ready for the artist to incorporate into jewelry. So far, the two have collaborated on more than 100 works. 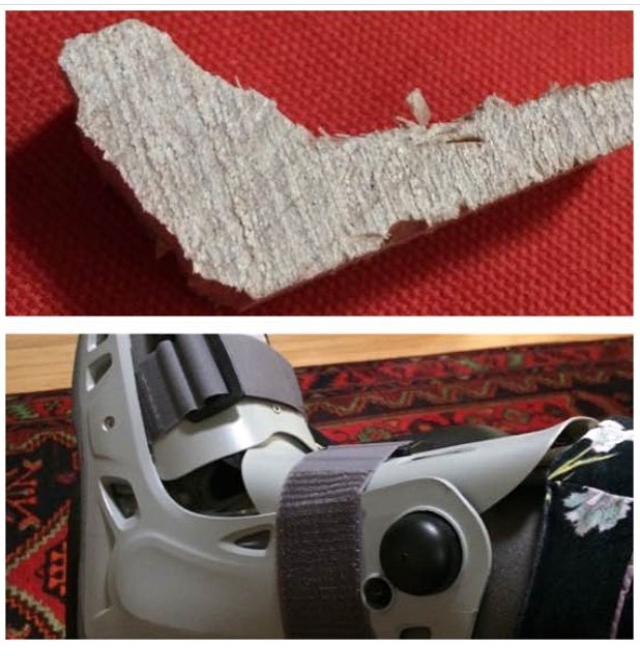 Last year, Faris broke her foot and came home wearing a special boot. The bird carved a piece of wood in a boot shape. Faris assumed it was a coincidence and tossed it on the pile with Charmin's other wood scraps. Charmin dug through the pile, found the piece and brought it to Faris, to make sure she got the point. The connection between them took years to develop. In the early days, “confronted with this being who didn’t have the whites in her eyes,” Faris couldn’t read avian cues. A veterinary emergency in 1996 changed everything. Charmin’s foot had been caught in a bird toy; she’d bitten off her toe to break free and lost a lot of blood. “It was shocking,” Faris recalls. “I came home, and she was bleeding, and it was horrific.” Faris rushed to the raptor center – she didn’t know where else to go – and maxed out her credit cards so Charmin could be stitched up. When she brought the bird home, she had to watch her carefully for several days to make sure she didn’t tear the sutures and start bleeding again. Faris slept on the floor, and Charmin stayed close, perched on her shoulder. That was “when I started to understand how she expressed pain and gratitude and everything else,” Faris recalls. In 2006, their relationship deepened; this time, Faris was ailing. She’d fallen gravely ill, and despite endless biopsies and bloodwork, doctors couldn’t identify her illness. They thought maybe Faris had contracted some rare disease from her bird, and they ordered her to keep Charmin in a cage and avoid all contact. Able to see but not touch Faris, Charmin was filled with anxiety. Faris ordered wooden chew toys for the bird, and as she lay on the couch watching, Charmin “would obsessively carve these things,” she says. The bird “almost used her beak like a lathe,” spinning rectangular wood pieces until they were little dowels or beads, she says. Over the six months Faris was confined to bed, when the two were in the same room but barred from contact, a ritual developed that continues to this day. Charmin would carve a wooden piece and, apparently satisfied with its shape, would climb to the top of her cage and toss it out. “I would wake up and see that she’d gifted me with something.” Twelve years later, Charmin still announces she’s got a nugget to add to the jewelry by flinging it out of her cage or bringing it directly to Faris. Either way, they’ve got an understanding. And Faris takes no piece before its time.